Join us this Christmas Season as MOPS moms discuss the joys (and yes, stresses) of being a mom at Christmas. Please join us for our last meeting of the year, December 19th, 9:15-11:15. We had a wonderful speaker today, discussing the use of Love & Logic. Many great techniques were shared on how to "better parent" children through the use of empathy and natural consquences. 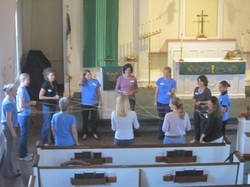 We had our first meeting October 3rd and over a dozen of us "plunged into" MOPS (the MOPS Intl. 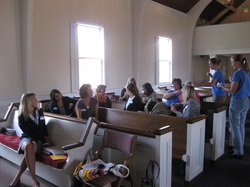 theme) reflecting upon the "mother's heart" as led by our mentor, Susan Stephens. We discussed our strengths, weaknesses, and enjoyable moments of motherhood, and had a wonderful warm breakfast and hot coffee! Thank you to all those that came and helped launch MOPS in Hudson. What a great beginning we had! Read a snapshot of our last meeting, as posted by one of the MOPS steering committee members.